Legal practice website design services Sydney. SEO & training included. Rank page 1 of Google. Wordpress website design specialist. 20+ years experience. Stevens & Associates are a legal firm located in Sydney’s CBD. They were referred to me by another client whom I had worked with for a long time. 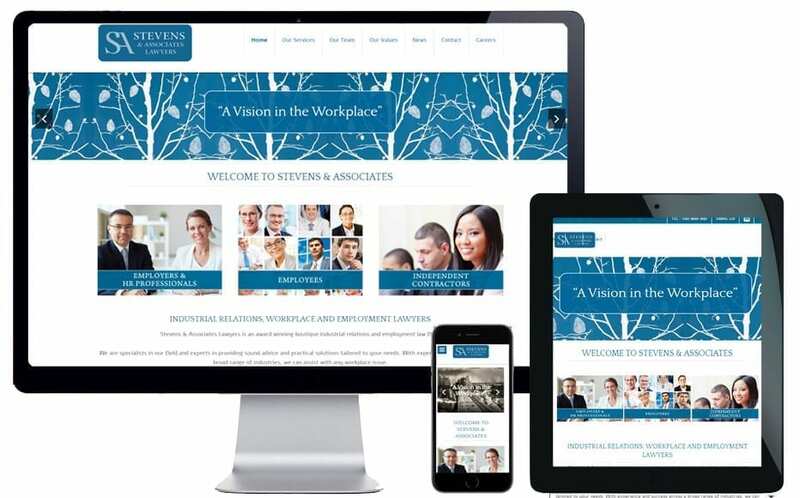 The original Stevens & Associates website had been designed in 2009. The design was very dated and, needless to say, not mobile friendly. Their previous website developer had gone AWOL so the content was out of date, links didn’t work and their newsletters took forever to download. I created a fresh, new design that was consistent with their brand and the caliber of their clientele. I added a blog so they could feature legal case studies, company news and other topical information. I also added newsletter subscription functionality so subscriber details are automatically added to their database. There is no longer any need to manually add or remove subscribers – the system manages all of this automatically. 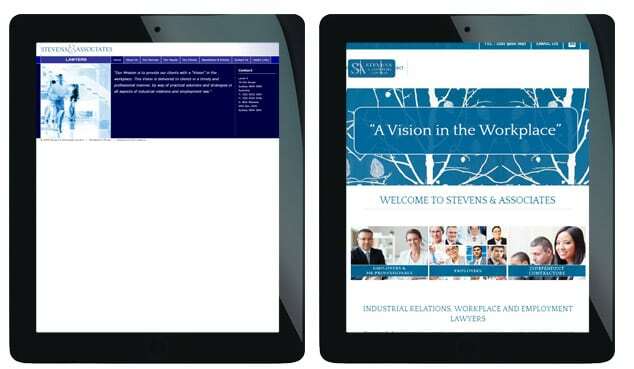 Above is a screen shot of the old Stevens & Associates website (left) and the new website (right) being viewed on a tablet device. Because the old website wasn’t responsive (mobile-friendly) the website simply reduces in size thus becomes illegible and the user has to “pinch-squeeze” their screen to read the text. The new website uses responsive technology which means all the elements on the page resize and adjust around to fit the screen. This makes text legible, links easy to click and images still visually effective. Stevens & Associates Lawyers is an award winning boutique industrial relations and employment law firm. They are specialists in their field and experts in providing sound advice and practical solutions tailored to the client’s needs. With experience and success across a broad range of industries, they can assist with any workplace issue. The firm take pride in the relationships they build, the quality of their team and the high level of practical advice and services they provide in all workplace matters.